Distributed Antenna System, what does it mean? 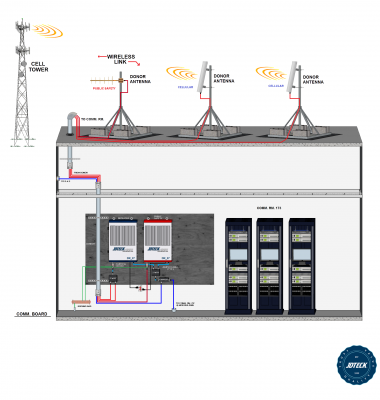 The acronym #DAS means Distributed Antenna System. It comprises of several components mated together to create a network that distributes signals across a specified area. There is a misconception by many that DAS refers specifically to an active fiber solution, however this is logically incorrect. The word distribution in the acronym DAS would mean any system with more than 1 distribution point. Therefore a system with just 2 service antennas is accurately referred to as a DAS (A Mini-DAS) because you have 'distributed' the signal to more than 1 point. There are two main types of signal distribution systems which are passive and active. A passive DAS solution in the true sense is not entirely passive but does has an active component at the heart of it called a repeater. The repeater is designed to receive a signal from a source point, be it OTA (Over The Air), via a Node / base station or Small Cell. The repeater then filters, amplifies and sends the boosted signal via a coaxial cable out to an engineered wiring grid that consists of coaxial cable, connectors, directional couplers, signal splitters and multiple antennas.